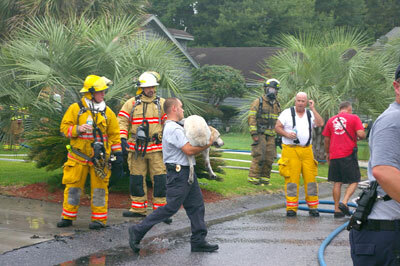 Carolina Beach Fireman Chad Soward carries "Stormy" to safety following a fire on Monday July 20. During the house fire Stormy hid in a bedroom on the opposite end of the house from the garage where the fire was believed to have started. 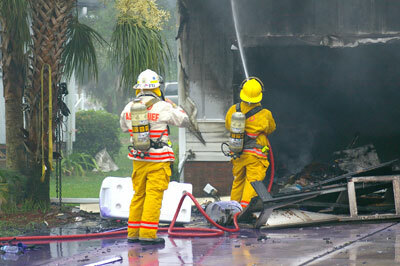 Firefighters continue suppressing hot spots in a house following a fire Monday morning. CAROLINA BEACH - On Monday July 20, at around 8:30am the Carolina Beach, Kure Beach and Federal Point Fire Departments responded to a house fire at 207 Teakwood Dr. in Carolina Beach. Police Officer and Firefighter Ray Lefler said when he arrived the two-car garage door was rumbling from rupturing scuba tanks. He recalled hearing explosions from within the garage. Mr. Hagain - a neighbor from across the street - said he heard an explosion that morning and called to report the fire. As firefighters battled the fire - which had made it’s way into the attic of the one story house - one person asked about the owner’s dog. The owner, Ben Lukowski, was out of town in the Hampstead area north of Wilmington when a neighbor called to inform him of the fire. Ben said the dog was in the house and he was returning home. When a neighbor inquired about it, firefighters began searching for the dog. They found Stormy in a back bedroom hiding under a bed. Firefighter Chad Soward carried Stormy outside, still alive and cooperating. Stormy was given oxygen and seemed fine despite all of the attention and commotion of people walking around in fire gear, loud trucks, and flashing lights. Stormy didn’t really like the oxygen mask, but took a few breaths before neighbor Karen Hagain lead him up to her font porch where he laid down to rest until his owner arrived. No one was injured. Two fire fighters required medical attention for heat and stress related conditions. The Carolina Beach Police Department contacted the North Carolina SBI to investigate. Stormy appeared healthy as he jumped into his owner’s truck. The online edition of the Island Gazette will be updated on Saturday and Sunday morning with all content from the printed edition for this week.